The music is definitely nice. Monolith seemed to have fallen from grace since the Xenosaga epIII/Baten Kaitos Origins days, but maybe there's hope after all. ...at least as long as we don't get a Xenosaga episode II-style experience. Eh, I beat Xenosaga ep1 and gave up on the series after forgetting all the events two weeks later. I might give this another shot, assuming it is a separate narrative, but we'll see. I'm actually more excited for The Last Story, Sakaguchi's new Wii project. Against my expectations, Lost Odyssey was pretty impressive, so I've been looking forward to his new shiz. Hmmm. Dunno how to feel about this one yet. The shots of the mecha fighting look good, though. I'm currently sloggin' through Xenosaga ep. II and have found it not altogether unpleasant but certainly not great. From this experience and those I had with ep.I and Xenogears I would hope this new series would improve on the pitfalls of Xenosaga and bring back what was great about Xenogears. Maybe playing Xenosaga ep. III will improve my expectations. That said, this - and the next Zelda depending on whether it is a retread (as has been hinted) or a truly new experience within the series - might make me purchase a Wii. Maybe. Hmmm. Dunno how to feel about this one yet. The shots of the mecha fighting look good, though. I'm currently sloggin' through Xenosaga ep. II and have found it not altogether unpleasant but certainly not great. The second disc of Xeno II is terrible - but slog through it. Still absolutely loving this game - just hit the Makna Forest area and it's a hella purty zone. If you can put aside the horrible resolution and jaggies, some of the actual environments here put FF13's to shame. The sense of scale is fantastic as well - some of these zones you explore feel really open and expansive. I almost wish I still had a small CRT TV to hand that I could play it on though - big ol' plasma's don't do the game any favours unfortunately. This is the first import game I've ever bought -- should be here soon. I'm excited to actually dust off my (modded) Wii! Hmm...a couple that are well worth a look are Silent Hill : Shattered Memories (controversially, probably my favorite Silent Hill game) and possibly Cursed Mountain (survival horror with Tibetan themes). I also picked up Disaster : Day of Crisis recently dirt cheap which I've not had the chance to crack open yet but looks like it might be a laugh. Think that might be another one that only got a UK/Euro release outside of Japan. Of course, there's also Resident Evil 4 (probably the best version of the game thanks to it's mouse-like aiming) and Okami. I'm lazy, so I'll just ask - based on what you've played, does Blade seem to have any connection to the Gears or Saga games besides the developer and the "Xeno" in the title? 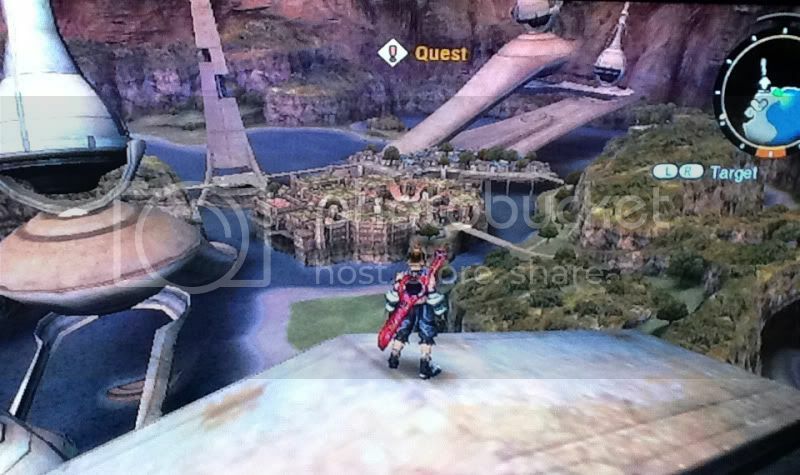 In January 2010, the game was renamed from Monado: Beginning of the World to Xenoblade to honor Tetsuya Takahashi, "who poured his soul into making this and who has been working on the Xeno series". so it doesn't sound likely. Didn't look like it had a link. Oh well, despite being misleading, as long as the game is good, that's all that really matters. I took a few days off after putting 20 hours in over 2 days. This is a very good game. stevenmack, what party have you been using? I'm considering changing it up a bit. I've been leading with Shulk since the beginning, but that is definitely getting stale. mostly sticking with playing Shulk with medic/sniper lady for support and then swapping out the other two now and again for the 'tank' role. Just picked up an "ether" based character though, so not sure where she fits into the roster yet. For sidequest stuff I've been swapping out playing as Shulk for someone else, since playing a character directly seems like the best way of farming reputation amongst two other party members at once - although I'm still not entirely sure what the reputation does other than unlock those little story bits dotted about the maps. This has been getting a lot of praise on the Eurogamer forum. Hyperbolic praise, really. I bought a copy in case it ran out, so I'm looking forward to playing when the pile is a bit clearer. Enter Riki the Nopon - Basically a furry volleyball with big flappy ears, a quiff and a backpack. I picked this up while on vacation in England after reading on Joystiq how easily I could jailbreak my Wii to play import games. I've only played about seven or so hours, but I'm inclined to get a bit hyperbolic as well. This is the first game I've played since Persona 3 that has reminded me of why I used to love JRPGs so much, and at least at the start it very much feels like a relic from the late PS1/ early PS2 era, when so many games weren't afraid to try a truly crazy experiment or two with the conventions of the genre. Also, I must admit that I'm a huge fan of the previous Xeno games. Flawed and unfinished as all four games were, they had a unique creative spark and were impressively ambitious in imagination and design. As such, I'm excited to see the ways in which that creative heritage shines through in this game, and I look forward to the inevitable crazy internet theories that will eventually crop up to tie the stories together. But yeah, lots of good things to say about the game so far. The setting and world design are as outlandish and unique as you'd hope to see given the previous work of the creators. The story and characters at least at the start seem to deviate a respectable amount from standard JRPG fare. The localization is pretty solid so far, and the voice acting is actually rather good (none of the first three characters have voices that make me want to stab out my eardrums!). The music is also well done so far, and the Xenogears fan inside me squealed with delight the first time I heard the unmistakable sound of a Yasunori Mitsuda composition come out of my speakers. And the graphics, hrm, well. I'm reminded of the scene in the movie Clueless where they compare a person to a Monet painting, although I think in the movie they made the comparison largely to negative effect whereas I think it's a mostly a positive here. Yes, up close this game is ugly as sh*t. One could take screenshots where you'd be hard pressed to believe that the game was running on anything more than a PS1. But, and here again I'm reminded of Xenogears, in that it's clear that a design decision was made around technical limitations, and that choice was to accept a low level of detail on the small scale (ie, horrendously low texture resolution, essentially no texture filtering, no attempt to make LOD models suitable for close up shots, etc) in order to allow the game to present large scale explorable environments. While I do wish they had made the game on a system where the cost of such a choice wouldn't have been so severe (and had the budget to do so without having to sacrifice elsewhere), I think all told I'm glad they did. After all, if all of Final Fantasy 13 had been as open as chapter 11, I might have been willing to forgive a lot more of that game's other foibles, so the idea of a game that is that open and potentially without said foibles has me very excited, even if it does make my eyes bleed from time to time. As stevenmack said, play this on an old SD TV if you still have one. And this is still not coming to North America, right? Sad panda face. Probably not, but check that Joystiq link in my last post. It might sound a bit complicated if you aren't technically inclined, but it's really not too hard to get your North American Wii to run import games. As for the cost of buying an import copy, well, not sure yet whether it is worth paying the premium -- I was fortunate enough to be physically in England to buy it the week after it was released, removing that factor from my decision -- but if it helps, the game is getting pretty universal praise AND good JRPGs are few and far between these days. It is just beyond stupid not to release this in the US. It is in English already all they need to do is publish it. What a waste. GAME is out of stock for it right now. I've finally decided to import it, so I'll have to watch for if they get it back in stock. Dammit. This is part of why I was waiting, hoping that after such good sales in Europe they might announce it coming to the US. I should've just imported it at release. They have said they're paying close attention to the Europe sales but that might've just been to appease the complainers. Japan is NTSC, so no. Basically, Nintendo doesn't think a Wii-exclusive JRPG will do well enough in North America to offset the cost of production, shipping, advertising, etc. I can't say they're entirely wrong in their assessment, as North America isn't exactly JRPG territory these days. Also, I think Nintendo is still really feeling the sting of Sin & Punishment 2 being a fan-demanded title that completely sunk when it was released here. Personally, I'd love it if they took an Atlus approach and just did a really, really limited run and reprint more copies if there's demand for it. I don't think they will, though. Or better yet, let Atlus publish it here. Let someone else take the risk. I bet Atlus would jump all over it. Well nevermind, then. They are just being stupid. That's a great idea. I wonder if Atlus themselves would do their thing and bring it over. That's what happened with Demon's Souls, right? Atlus in the US, but Sony in Japan? Of course, Sony going for it doesn't mean that Nintendo would. Although, it must be said that the English localization is idiomatically quite British (for example, it uses the word "veg" in general reference to eating vegetables, ie, "Would you like some veg with your meal? "), so they might feel like they would need to go through and fix some of the things that would be idiosyncratic to North Americans. But really, how many games get released in the UK with an idiomatically North American localization? Quite a few, and if the British can sort it out on a regular basis, we can do it too once in a while I'd think. Other than that, though, I guess they don't figure they would sell enough copies here to cover the costs of marketing and distribution, and sad as it is to say I'm not sure they are wrong. This is not the sort of game that sells on the Wii, you know? But, at the very least those of us who are inclined to do so have some way to play the game, right? I bet Atlus, Xseed, or Ignition would be happy to do this, but this is Nintendo we're talking about, and they're not going to relinquish any control of any of their properties anytime soon. That's sort of funny. I haven't played very far into the game at all, but I was wondering to what extent characters' British accents are supposed to just sound normal (as opposed to sounding like dandies). Eh, we're talking about the niche in the gaming market that is happy to retain Japanese voiceovers with English subtitles oftentimes. I don't think that some idiosyncratic British voicebytes are going to be a problem. Oh, neither do I -- but NOA might.